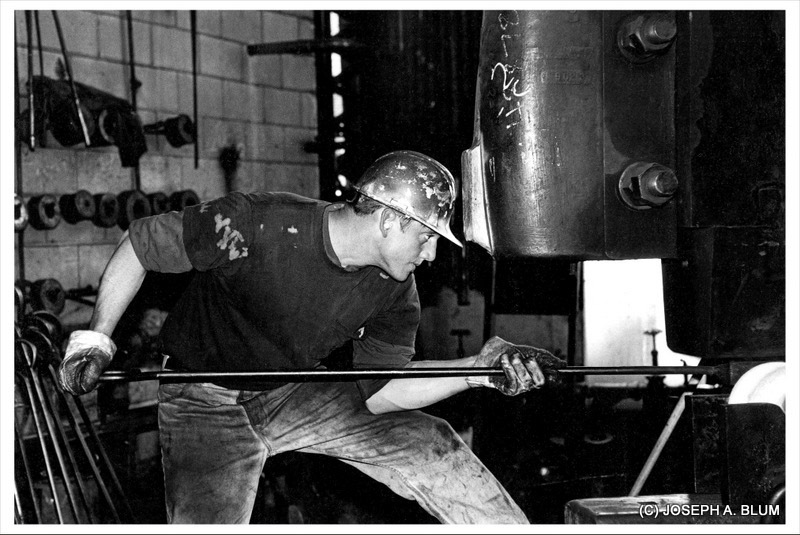 Blum will present a series of his photographs documenting the labor of ironworkers, carpenters, glaziers, and other tradespeople at work in the Bay Area and abroad. Blum’s photographs document the shipyards and the metal trades workshops of what was once a flourishing blue collar industry in the Bay Area. Recently he has photographed ironworkers and other craftspeople constructing significant high rise buildings in downtown San Francisco, carpenters and glaziers rebuilding the Conservatory of Flowers in Golden Gate Park, pear pickers in the California Delta, the construction of the Al Zampa Memorial Bridge across the Carquinez Strait, and the construction of huge maritime cranes in Shanghai, China and their delivery to the Port of Oakland. He documented the workers constructing the new east span of the San Francisco-Oakland Bay Bridge, a project he followed from its inception to its completion in September 2013. Joseph Blum worked as a boilermaker, shipfitter, and welder for twenty-five years in the shops and shipyards of the Bay Area. Since retiring from the trades, Blum has dedicated himself to documenting the labor process in words and photographs. His photographs have been exhibited in galleries and museums throughout the Bay Area. A talk and book signing for his book of photographs documenting the social upheaval of the late 60's and early 70's. What's Going On? is a collection of Ken Light’s photos, from 1969 to 1974, documenting the social landscape of America in upheaval. He began as a participant in the youth movement, and then became an observer of the entire spectrum of the cultural and political wars in America. This photographic journey opens with the quiet before the storm: high school students with their Eisenhower textbook, retired people playing cards and cafeteria workers quietly striking. We feel the pent up tension with no outlet. And then, suddenly, the new worldview bursts forth. We follow this rupture, the Vietnam Moratorium, Republican Convention, riots, POW’s coming home, until the end of the era when Nixon resigns. What’s Going On? shows the gritty truth of the working class trying to keep a toehold on the American Dream as wages stagnated and unions weakened. It shows how college students became disillusioned, and then empowered to protest. It shows the United States divided politically as the new, more egalitarian, world order was forced upon it. Ken Light has worked as a documentary photographer, focusing on social issues facing America, for over 45 years. His work has been published in nine books and in numerous photo essays in magazines, newspapers and a variety of media (electronic & film). His photographs have been featured in over 190 exhibitions including one person shows at the International Center for Photography (NYC), Oakland Museum of California and other museums in the US and abroad. Ken Light is the Reva and David Logan Professor of Photojournalism at the Graduate School of Journalism at U.C. Berkeley. He was a co-founder of Fotovision, and the International Fund for Documentary Photography at Mother Jones Magazine. ​Monumental. Iconic. Daring. Dramatic. The largest of its kind. These are the terms often used to describe the signature element of the new east span of the San Francisco - Oakland Bay Bridge -- the Self-Anchored suspension span. The construction process was as breathtaking as the bridge's design, involving precise choreography on a massive scale. 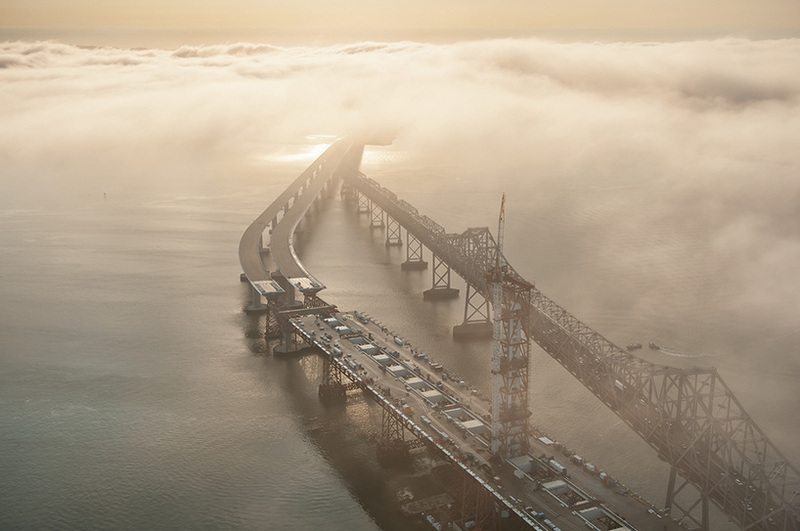 Barrie Rokeach will explain his role in producing aerial images of the construction of the new Bay Bridge from 2009 through its opening in 2013. He will talk about the challenges of shooting from the air in demanding conditions: during bad weather, before sunrise and after sunset, and often for long stretches of time. Rokeach will discuss the complexity of documenting the construction process for various purposes, products and clients, all while maintaining a fresh approach and creative perspective to his imagery. Barrie Rokeach is a fine art and commercial photographer specializing in aerial photography. He flies an airplane while simultaneously producing imagery. Rokeach has exhibited in dozens of museum and galleries, has been featured in magazines, newspapers and on television, and has taught at various institutions including the University of California, Berkeley. He is the author of three photo books. In 2013 one of his aerials was reproduced as a USPS stamp. Rokeach has an MA in Design/Photography from UC Berkeley, where in 2008 he was chosen as a Distinguished Alumni, and has given dozens of lectures and slide shows at Bay Area institutions. Berkeley photographer David Garnick discusses the creation, the inspiration, and the history behind his artistic photography series Thirty-Six Views of the Bay Bridge. A re-interpretation of 19th century Japanese woodblock artist Hokusai's Thirty-Six Views of Mount Fuji, Garnick's photographs feature the tower of the new Eastern Span of the San Francisco - Oakland Bay Bridge with its sweeping cables echoing the slopes of Mount Fuji. The visual style of this series references the romanticized landscapes of Hokusai and of early 20th century lithographs. David Garnick set up his first darkroom over forty years ago. He has also worked in other media, studying drawing, sculpture, and woodworking. After earning degrees in philosophy and computer science, he chaired the department of computer science at Bowdoin College, in Maine, and later was a product manager for Google News in Norway. Combining his backgrounds in the arts, education, and production with his passion for photography, Garnick founded and directed the San Francisco International Photography Exhibition. Garnick lives in Berkeley, California, and works throughout the San Francisco Bay Area. 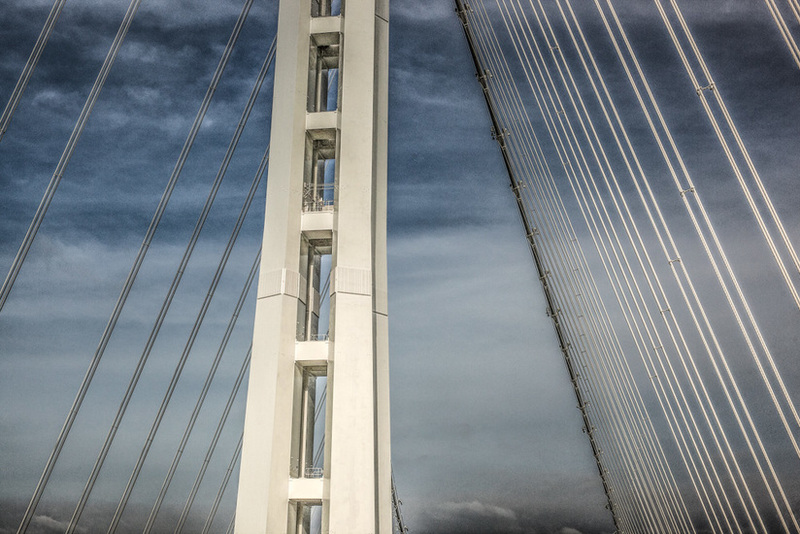 Come meet Berkeley photographers David Garnick and Barry Rokeach at the opening of a show featuring their unique perspectives on the new east span of the San Francisco - Oakland Bay Bridge. Details about the show are on the exhibition page. Join us Saturday, February 6, 2016 for a Felted Heart Pin Workshop with Mirto Golino! This is a great introduction to needle felting if you've never done it before! You will make at least one small heart pin and sew a pin back to it. Beads and charms will also be provided for those that want to further augment their creation. You will own a foam mat and 2 needles when you leave the workshop- This will enable you to continue working with your new needle felting skills!! Class is from 2:00 - 4:00pm. Cost is $30 for the class plus a materials fee of $12.00. If you aren't able to attend a workshop for which you've already registered/paid, please contact us to cancel your reservation within 72 hours of the event. Credit will be given in the form of a gift certificate - no refunds provided for cancellations. Join us Tuesday, January 19, 2016 for a Collage Workshop! Katie McCann will show you how to make an analog collage from images cut out from magazines and books. All materials will be provided and there will be a large selection of images and ephemera for the students to work with. Each student should be able to complete one collage per session. We will talk about composition and different techniques and then the students will be able to first source their images, compose their collage and then finally glue the finished composition. There will be an emphasis on freedom of expression and creative collaboration amongst the students. Class is from 6:00 - 9:00pm. Cost is $45 per class. There is an additional materials fee of $5.00. Katie McCann "Beware the Autumn People"
Join us Wednesday, October 21st for our first Collage Workshop! Katie McCann will show you how to make an analog collage from images cut out from magazines and books. Class is from 6:00 - 8:00pm. Cost is $40 and includes all materials and tools needed to make your own awesome collage! Zach Pine will start with a brief demonstration and introduction to the physics, techniques, and aesthetics of balanced rock sculptures. Then he will invite you to work in a spirit of playful exploration while I offer one-on-one instruction. See these photos from past workshops at ACCI. No previous rock balancing experience is required. Everyone's work will be included in the online gallery Zach creates from workshop photos. Making balanced rock sculptures: an art form, a working meditation practice, a tangible connection to Earth, an avenue for self-discovery and personal growth, a playful exploration of the force of gravity and other laws of physics, a paradigm for solo and group empowerment, a form in which to practice equanimity during collapse and rebuilding, and a joyful and moving way to connect with others and with the environment. The workshops are held in the garden of ACCI Gallery. Each session is limited to five students, and ADVANCE REGISTRATION IS REQUIRED. Every past workshop has been full, so early registration is recommended. Contact Zach to register. Register either for the 11:30am workshop or the 1:30pm workshop. The workshop fee is $15 (one scholarship slot is available in each workshop). 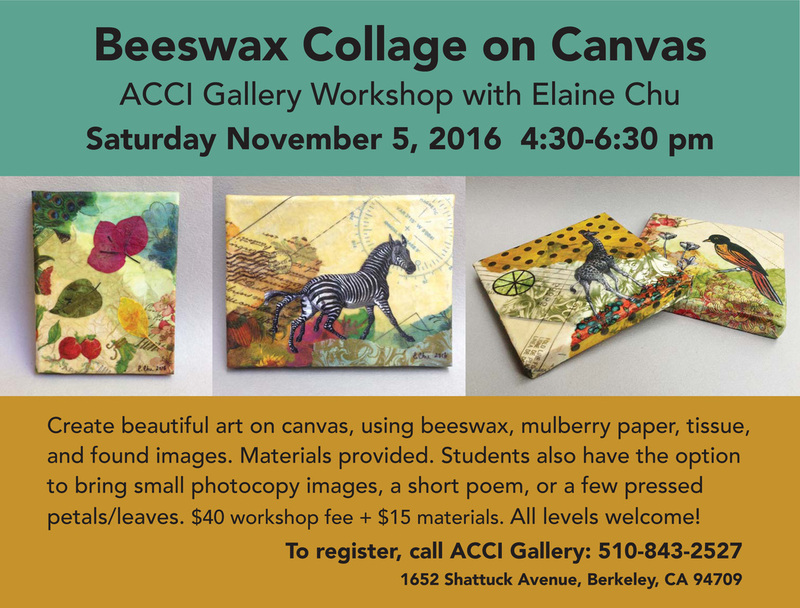 All proceeds benefit ACCI (Arts and Crafts Cooperative, Inc.). Bring one rock (any size) to the workshop as a donation, and wear clothes that are suited to sitting on the ground while you work. Artists tend to collect cool things - sometimes too many cool things! In honor of Earth Day, we've asked our ACCI artists to do some Spring cleaning and donate their surplus of art supplies, art books, interesting household goods, and random odds and ends for a Garage Sale. Our garage is located on Lincoln Street where there is free parking on Sundays. We'll be using proceeds from this sale to increase our community outreach efforts including our upcoming involvement with the Berkeley Arts Connect internship program. By upcycling these items, your purchases from our Garage Sale will go towards more cool things! Tickets are available for sale at ACCI Gallery. Seating is limited. Tickets may also be purchased online for will call only. ABOUT THE PERFORMERS: A young and passionate group dedicated to dynamic performances in alternative spaces, CELLI@BERKELEY is an ensemble based in Berkeley that seeks to generate new repertoire for the cello. Celli@Berkeley was founded in 2012 by undergraduate and graduate students studying a variety of academic disciplines at UC Berkeley (including statistics, music, environmental science, history, chemistry, biology, and public health). On sunny days, members can be heard performing pop arrangements outdoors on the UC Berkeley campus. Celli@Berkeley released its debut CD album in January 2015, featuring new and old works by Jared Redmond, joshua carro, Daniel Leo, Anica Galindo, Michael Nicholas, and Julius Klengel. Ambassador, metalsmith, and perpetual student of the Penland School of Crafts, Lilla Cory Warren, will briefly share the rich history and present day workings of the renowned craft school in the Blue Ridge Mountains of North Carolina, and reveal all you wish to know about what it is like to immerse oneself in a two-week intensive summer course, or an 8 week concentration. The beautiful campus of Penland is home to studios for every medium- hot glass, flame working, ceramics, iron, metals, photography, wood, textiles, painting, drawing, letterpress, printmaking, and you never know what else might show up on the schedule. Come learn about the scholarships offered, and check out the fresh catalog for this summer! The roster of incredible, world class teachers changes every year. Deadlines for registration of summer classes are coming up soon, and there are always fall classes as well. No cover charge. Reserve your seat by emailing info@accigallery.com with number of attendees. Enjoy a glass of wine while Dr. Basha talks about her 35-plus years of transformational work with people from all walks of life, and the inspiration behind writing her book, The Inward Outlook. The Inward Outlook encourages readers to find guidance from within. Basha says, "This book points you in the direction of realizing that the guru is within you. Everything you're looking for, you already have." The event is free of charge, however, seating is limited. Email us at info@accigallery.com to reserve seating. 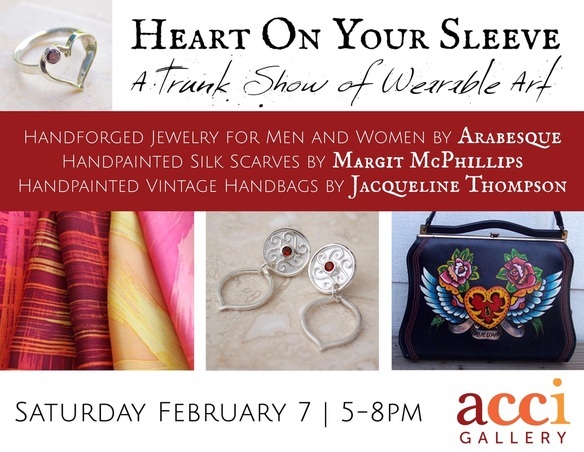 ACCI Gallery is pleased to announce our first Trunk Show featuring three of our spectacular artists! Stop by for a sip of wine and bite of cheese and check out new work featuring three of our spectacular artists who make lovely wearable art. evening 2/11/15 to have a sip of wine with you! Sample local small production wines and enjoy small bites at participating businesses along Shattuck & Vine St. in the Gourmet Ghetto. Specials and sales too! 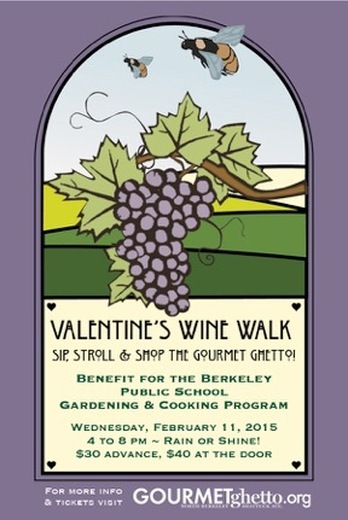 All proceeds will benefit the Berkeley Schools Gardening and Cooking Program, which provides garden-based cooking and nutrition education in our public schools! Will Call-Ticket Sales Tent will be at the at corner of Shattuck & Vine.